The Department of State has released the September Visa Bulletin – the last such bulletin in the 2017 fiscal year – and as expected, it shows either retrogression, stagnation, or incremental forward movement for all categories. USCIS has separately confirmed that all prospective adjustment applicants should consult the “Final Action” charts, which are reprinted below. Many family-based categories were either stagnant or retrogressed for September, specifically F-1 (which retrogressed for China, India, and All Other), F-2B and F-3 (which saw no movement for China, India, Mexico, and All Other), and F-4 (which saw multi-year retrogression for China, India, and All Other). The Department of State has indicated that the October Visa Bulletin will show F-1 and F-4 categories returning to their August cutoff dates; hopefully other categories will see genuine forward movement at the same time. 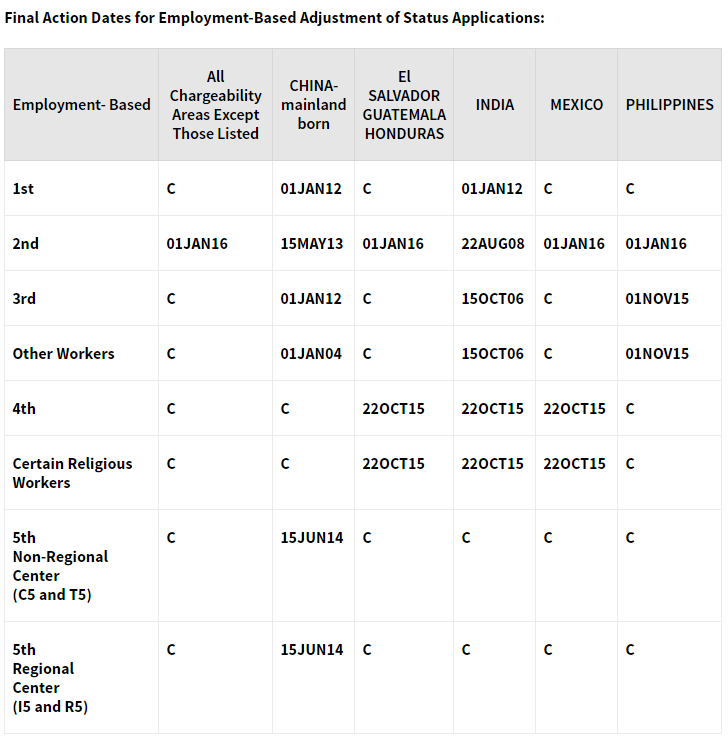 Unlike family-based categories, employment-based categories did not see any retrogression, though some categories did remain stagnant, including EB-1 China, EB-1 India, and EB-3 China. Other categories saw advancement of between a few weeks and a few months. The Department of State has previously indicated that certain EB-2 categories, including EB-2 Mexico, EB-2 Philippines, EB-2 El Salvador / Guatemala / Honduras, and EB-2 All Other, will all become current in October.